Looking at it, there's no question that the OD&D chart is modeled on the one from Chainmail but there are also a lot of differences between them, particularly when you look at the Neutral column. I find two things very interesting with this chart. Firstly, Wizards serve either Law or Chaos. There are no neutral Wizards, which makes sense when you think about it as allegiance to higher (or lower) powers. In later editions of D&D there was a tendency to treat magic-users as atheists, rather than beings that dealt with otherworldly powers. This is something I like about the DCC RPG - the idea that wizards make pacts with otherworldly entities. Couple this with the fact that Superheroes (Paladins?) and Magic Swords are also lawful and you have a much more unambiguous idea of the differences between each side. Secondly, there is no real actual Neutral alignment. 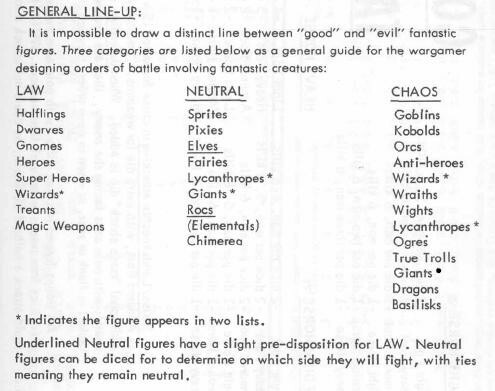 The original three alignment system pre-supposes that the only battle that will be fought would be of Law vs Chaos, and that Neutral creatures may fight on either side (presumably the one that provided the best offer .. or the offer that couldn't be refused). It's really a selection list to see who can fight on which side. From a wargaming point of view you are going to get a disciplined army on the side of Law, and a large undisciplined rabble on the side of Chaos (who are apt to turn on each other at the drop of a hat filled with silver).. In fact this is pointed out in Greyhawk where gamemasters are urged to give consideration to the effectiveness of coordinated actions by lawful characters, and to hinder the continued cooperation of chaotic characters (although no rules are given for doing so). do you think they will ever republish chainmail? What stands out to me is "orders of battle". In other words, how these forces would behave on the battlefield and nothing to do with quasi-mystical qualities. Lawful forces should be regimented, well-supplied, and disciplined, but also stubborn, predictable, and unimaginative. Chaotic forces should be unpredictable, unconventional, and independent, but also disorganized, uncoordinated, and self-destructive. Neutral forces should combine the advantages/disadvantages of both sides. This page from Chainmail is what made it very clear to me that alignment began as simply the same sort of allegiance thing you find in many wargames. “Law” and “chaos” here aren’t really any different than “axis” and “allies” in a WW2 game. 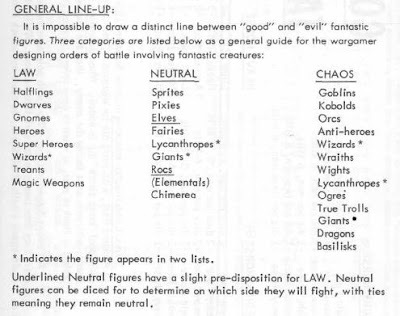 I'm wondering why Gygax found it impossible to make a sharp distinction between good and evil, particularly in the (presumably simple) context of fantasy warfare. I assume he had a changed perspective on the matter when he developed the nine-point system. Did he ever clarify alignment matters in his later years? On En World perhaps?